“As a NASA training manager, I knew Jerry Ross as one of the steadiest and smartest astronauts in the agency. He was also one of the nicest! No matter who you were or what your job was, Jerry always took the time to express his appreciation for the work you were doing. Frankly, considering the pressures we were always under, I wondered what made Jerry so nice. Now that I've read his memoir, I know! Jerry Ross is the genuine article, a man of humble roots who decided to be the best he could be while never forgetting the lessons of honesty, integrity, and family he learned along the way. Great memoirs have to strike a balance between history, circumstance, purpose, and passion. 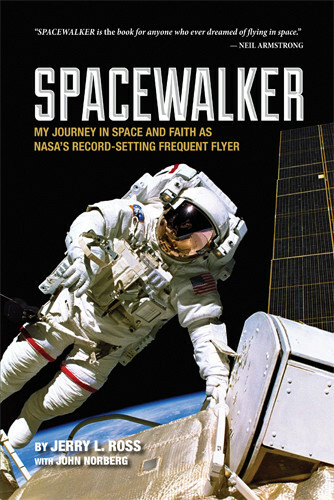 By this or any standard, Spacewalker is a great memoir. Jerry tells his story straight from the heart, and it is a magnificent tale of courage and faith. If you liked Rocket Boys/October Sky, you're going to love this book!"